Honesty is hard to come by in the movie industry. With millions of dollars at stake, safe repetition is often the easiest, well-treaded path. My Life Directed By Nicolas Winding Refn, a 58-minute documentary about the making of Only God Forgives, challenges the norm and reveals a working director’s latest film and his struggle to figure out how to bring it to life. The film was shot by director Nicolas Winding Refn’s wife, Liv Corfixen, and it gives us intimate, day-by-day access to their life together during the six-month trip to Thailand with their two children and the way Refn tries to blend being an artist and having a family. Challenging and engaging, it’s a documentary that is perhaps more interesting and deep than the film it is about. We begin with Refn trying to create a project that will creatively fulfill him but also continue to lead him to success. Refn is hyper aware of the pressure on himself and his star of the hit Drive, Ryan Gosling, to follow it up with another commercially successful film. Yet despite this outside pressure, Refn seems to intentionally dig himself into a non-commercial grave. He wants to be successful but he doesn’t want to give up his creativity or do what is expected of him. Going on, if you get the sense that he has a lot of dueling emotions internally, you’d be correct, and the film lays that bare. I’ve enjoyed many of Refn’s films but I’ve also had no particular love for others. Yet even when I watched Only God Forgives I got the sense that it was the filmmaker’s absolute vision. This documentary challenges that viewpoint and questions if even he knew what kind of vision he wanted to put up on screen. If one listens to Refn’s interviews, you’ll find he is very lyrical in the way he presents things as an artist. He makes that plain as can be, but he isn’t afraid of saying that he is also struggling. When he breaks down at one moment, complaining that he doesn’t know what he’s doing in the middle of the production, he is asked why he seems so confident on set. The director in him has taken over. He understands that his role as the head of the film is to project confidence, and explains just that. He is shirking commercial opportunities left and right because he wants to retain the freedom and creative control he is used to. He doesn’t want to get into marketing meetings that he would be dragged into on a $100 million movie; even though he may desire that kind of budget, he doesn’t want the stakes. He is constantly trying to push the boundaries, whether it is the iconic bursts of violence in his films or the way he attempts to turn our expectations on their head. Corfixen smartly edits the film and chooses to revel in the way that Refn and her interact and move around the production and the hectic schedule it presents. The documentary follows the reaction out of Cannes — famous for booing or cheering and wearing their hearts on their sleeves — and how his film Drive got a standing ovation there, but Only God Forgives garnered a wave of boos. A similar reaction was felt in the press, with so many of the same people that praised Refn for Drive giving him negative reviews for Only God Forgives. As we see, perhaps sadomasochistically, Refn doesn’t avoid the bad reviews as he wants to know how his films are being received. But it’s Corfixen that gives him perspective when he needs it most. The opening features fellow famous auteur director Alejandro Jodorowsky — who Refn has dedicated his latest film to — doing a tarot card reading and explaining Corfixen’s difficulty being the wife of a creative and having to support him emotionally; we get the sense that this isn’t far from reality. Plainly, life is difficult for Refn at times, and My Life Directed by Nicolas Winding Refn shows both the curious nature of being in that position and why he continues to garner a reputation as a director to seek out. 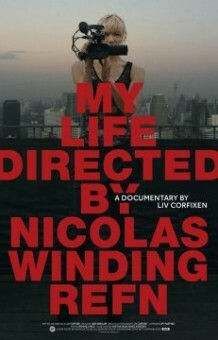 My Life Directed by Nicolas Winding Refn premiered at Fantastic Fest.